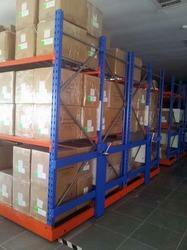 Our company offers a wide range of Mobile Racks that is engineered to recover the lost floor space. These savings are fabricated to reduce the number of aisles between the rows and racks, which requires only aisle for each block of rack. 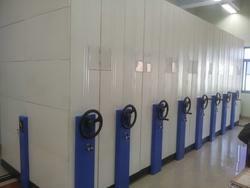 Furthermore, these racks are bolted to the base unit and can be manually operated. The range of racks can be fitted on the base in which the drive mechanism and the load carrying wheels are mounted. Moreover, we also offer hand operated mobile shelving that imparts the movement of the base with the help of a hand wheel that is situated on the end of each shelving. A wide range of Mobile Racks that is engineered to recover the lost floor space. These savings are fabricated to reduce the number of aisles between the rows and racks, which requires only aisle for each block of rack. 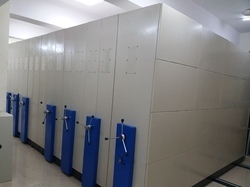 Furthermore, these racks are bolted to the base unit and can be manually operated. The range of racks can be fitted on the base in which the drive mechanism and the load carrying wheels are mounted. Moreover, we also offer hand operated mobile shelving that imparts the movement of the base with the help of a hand wheel that is situated on the end of each shelving. 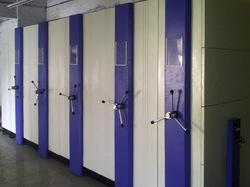 Our company offers a wide range of Mobile Racks- FILING COMPACTOR that is engineered to recover the lost floor space. These savings are fabricated to reduce the number of aisles between the rows and racks, which requires only aisle for each block of rack. 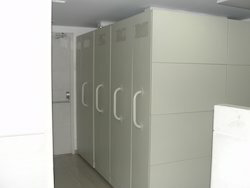 Furthermore, these racks are bolted to the base unit and can be manually operated. The range of racks can be fitted on the base in which the drive mechanism and the load carrying wheels are mounted. Moreover, we also offer hand operated mobile shelving that imparts the movement of the base with the help of a hand wheel that is situated on the end of each shelving. Widely used in residential areas.